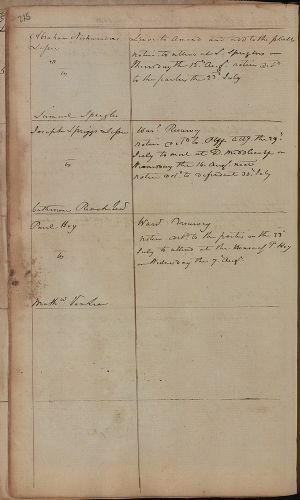 Abraham Nishwander's Lessee vs. Samuel Speigler Leave to amend and add to the platts. Notice to attend at S. Speigler's on Thursday the 15th August. Notice delivered to the parties the 23rd July. Joseph Spriggs' Lessee vs. Catherine Rench, Sr. Warrant Resurvey. Notice delivered to Plantiff's attorney the 29th July to meet at D. Middlecalf's on Wednesday the 14th August next. Notice delivered to defendant 30th July. Paul Hoy vs. Mathw. VanLear Warrant Resurvey. Notice delivered to the parties on the 23rd July to attend at the House of P. Hoy on Wednesday the 7th August.